Broadway’s new show 13 Musical highlights the experiences of a boy’s growing up and the lessons he learns in the process. Currently running at Bernad B Jacobs Theatre, this 90-minute musical is the story of a young lad living in New York as a part of a happy family. His whole life turns upside down when his parents get divorced and he is forced to shift out with his mother. The move clashes with the young boy’s 13th birthday and the Bar Mitzvah. The all teenage cast musical is aimed at youth at large and outlines the story of growing up and the anxieties and the excitement they go through. 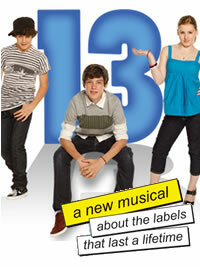 13 Musical is based on a book by Dan Elish and Robert Horn and has songs by Tony award winner Jason Robert Brown. The show was premiered at Los Angeles’ Mark Taper Forum in 2007 and was transferred to Broadway earlier this year. Running since October 5 this year, 13 Musical casts a spell as it takes us through the journey of the boy who feels he’s been uprooted from his happy life and taken to the lamest place on earth. Evan Goldman’s attempts to make new friends at middle school and efforts to become a part of the in-crowd are bound to interest the younger generation who can feel his anxieties and visualize the complications faced by him. Goldman played by Graham Philips wants students at the Dan Quayle Junior High to attend his Bar Mitzvah and thus schemes and befriends the mean girl Lucy played by Elizabeth Egan Gillies and the school jock Brett played by Eric M Nelson. While Goldman is trying to woo the head cheerleader Kendra played by Delaney Moro and other cool kids, he tries to be what he is not and in the process loses two of his close friends - Patrice the intelligent girl played by Allie Trimm and the physically disabled Archie played by Aaron Simon Gross. Telling youngsters that they need to be themselves to gain true friends and not pretend to be somebody they are not in a bid to make cool friends, 13 Musical brings out the conflicts faced by Goldman in his attempts to increase the list of invitees at his Bar Mitzvah. The show’s 13 wonderful songs are excellently sung by the teenagers and make the musical touch the lives of young and old alike. The show directed by Jeremy Sam takes us through all the emotions: sadness and happiness through its dramatic yet realistic portrayal of Goldman, a Jewish boy facing the trauma of growing up. The portrayal of the various situations that highlight jealousy, fights, gossips, break up or making of friendships are bound to hold the interest of every teenager. So grab the tickets of this show from any registered broker of Broadway. Choreographed by Tony Award nominee Christopher Gattelli, 13 Musical has Tom Kitt as its music director. The show is presented by Broadway and its onstage teen band members include Lexi Bodick on bass, Zac Coe on percussion, Adam Kaufman on keyboard, Zach Page on guitar, Chris Raymond on guitar and Charlie Rosen.